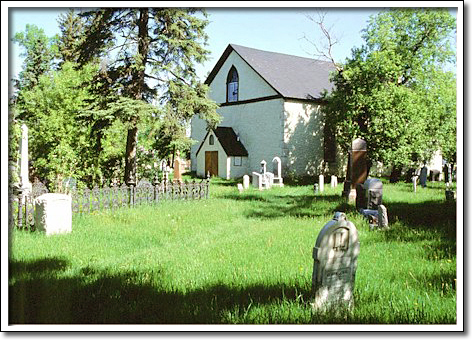 In 1854 this, the first Presbyterian church in Western Canada, was completed. It was erected under the direction of the Reverend John Black, the first resident Presbyterian minister in the West. Black came to Kildonan in 1851, 37 years after the arrival of the first Presbyterian settlers from Scotland. Prior to this event the settlers attended Church of England services. Duncan McRae, an important Red River stonemason, supervised the construction. Like other surviving stone churches from this era—St. Andrew's Anglican (1844–49), St. Peter's Anglican (1852–53), St. Clement's Anglican (1862–63) and Little Britain United (1872–74)—this building's design is derived from the small parish churches of Great Britain. The old country examples, with their rough stone walls, pointed windows, and gable roof, were recreated in this province. A distinctive façade design was also undertaken in each of these Manitoba landmarks. At Kildonan Presbyterian a bell tower of delicate design once rose from the roof.